Japan-based car maker Honda has released a unique car model that is aimed exclusively at women; the first automaker to do so. Appropriately named the Honda Fit She’s, the car sports lots of pink and is embezzled with quirky extra’s that are perfect for a lady. 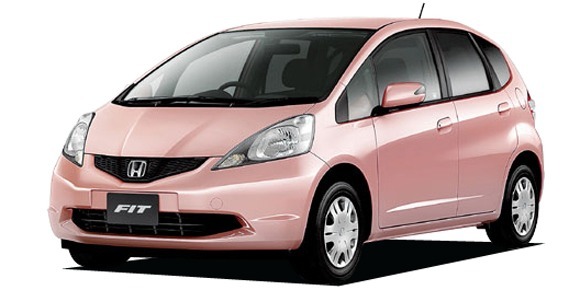 Going for an all around style of “adult cute”, Honda decided to make pink the sole color inside and outside of the car. With an all metallic pink exterior, the interior is adorned with pink stitching everywhere from the steering wheel and seats to the floor mats and shifter. There is also pink metallic metal around all of the displays and controls. If that is not girly enough for you, there is also an adorable little heart in place of the apostrophe in the “She’s” logo at the back of the car that is also complete in about 3 shades of pink. Of course if pink isn’t your color, the car also comes in shades of brown and white. Pink isn’t the only women-geared idea that Honda has put into the car. They also thought of a special windshield glass that protects from an amazing 99% of UV rays as well as an air conditioning system called “Plasmacluster” that can apparently improve skin quality. Priced at $17,500 the Honda Fit She’s is hoping to be attractive to women in Japan who are just now starting to enter the workforce despite previous years of being forced to stay home.